NESTLED ALONG THE EAST COAST of Central Florida, 21 Riverside is a modern condominium that is surrounded by the echoes of the prosperous past. Located in the Historic Cocoa Village, the condominium offers a stunning river- front penthouse that overlooks the Intracoastal Waterway and provides 180-degree views of the Indian River, the Kennedy Space Center, Cocoa Village and Merritt Island. Imagine witnessing history-making launches from your 10th-floor wraparound balcony or daydreaming about the many carefree cruise ships entering and leaving Port Canaveral. It is not easy to find places that willingly embrace the past while observing the future, but 21 Riverside in Historic Cocoa Village pulls it off with élan. This spacious penthouse with 10-foot ceilings offers a gourmet kitchen with top-of-the-line appliances, cherry cabinetry, granite counter tops and a butler-s pantry that includes additional appliances such as a wine cooler, extra refrigerator and dishwasher. The three bathrooms are luxurious, and hardwood, carpet and marble tile flooring is throughout the residence. "There are only 15 units in this building which is unusual," states Donna Sullivan, Realtor for Interactive Realty in Brevard County, Florida. 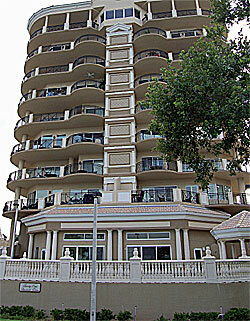 Two units occupy nine floors, while the penthouse claims the entire 10th-floor. The small building and private elevator provides the seclusion many owners seek. Located in the heart of a town that survived a disastrous fire in 1890 and a brutal freeze ia few years later, 21 Riverside is surrounded by historic homes to the west and south.The complex was built in 2004 on a former home site, while a nearby residence was moved by barge and will soon be made into a bed and breakfast, preserving monuments of the past. The building is within walking distance of Historic Cocoa Village, which offers fine dining, shopping and other attractions that include a community theater and a beautiful city park. Listed at $2,350,000, the penthouse will surely bring its owner tremendous joy and a small piece of Cocoa-s vitality.